100% dried sugar cane juice. Sugar canes are carefully washed, gently squeezed and the juice obtained is dehydrated and crystallized only through evaporation. 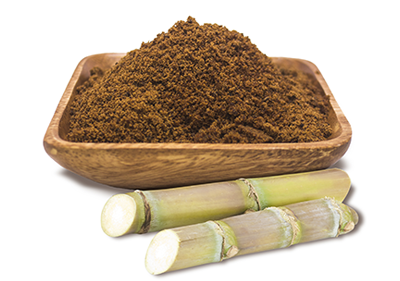 It is a nutritious product that retains it molasses content supplying natural occurring minerals to keep us healthy. Rich brown sweetener with a caramel flavor. Use as a sweetener of any type of drinks. Replace brown and white sugars in same quantities. It prevents nutritious anemia (due to iron deficiency) and rickets (due to vitamin C deficiency). It also provides energy without the "sugar rush" and blood sugar spikes that are the result of refined sugars. Organic, Kosher, Vegan, Gluten-Free and GMO-Free. Free of additives, irradiation and BSE/TSE.